Disclaimer: This information is to be used only as a general guide. Any specific questions you may have regarding you treatment or care should be directed to your physician or health care professional. 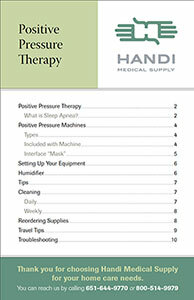 Positive pressure therapy is ordered after an overnight sleep study has taken place. This sleep study provides your doctor or nurse practitioner with information on the quality of your sleep. Because the diagnosis of Obstructive Sleep Apnea (OSA), Central Sleep Apnea (CSA), or another related sleep disorder has been made, positive pressure therapy has been prescribed for you. 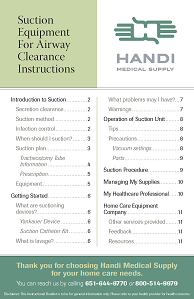 This Booklet will give you General information to assist you. Oxygen is a drug. It must be ordered by a doctor or a nurse practitioner. Your order will tell us how many liters per minute. 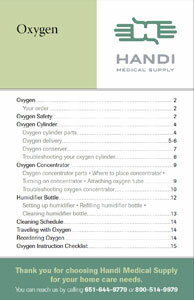 (LPM) You need and how many hours per day you should use the Oxygen. Oxygen is a gas; this gas does not have a taste or a smell. In the air we all breathe (room air) there is 21 percent oxygen. When your heart and lungs are working well, this is enough oxygen to keep your body healthy. If you have a problem with your heart or lungs you may need added oxygen; this is called supplemental oxygen. 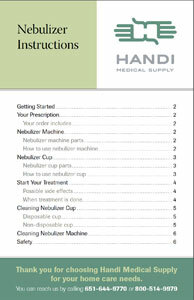 A nebulizer machine used with a nebulizer cup turns liquid medicine into a mist so it can be inhaled into your Air ways. Your doctor has ordered this system for you, using this to deliver your medication is called a “treatment”. All people need food to live. Sometimes a person cannot eat any or enough food because of an illness. The stomach or bowel may not be working quite right, or a person may have had surgery to remove a part or all of these organs. Nutrition must be supplied differently because of those conditions. Enteral (En-ter-al) nutrition is another way people can receive the food they need. 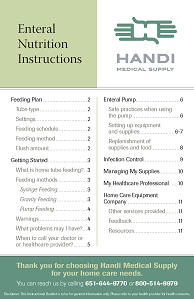 Also called "tube feeding," enteral nutrition is a mixture of all the needed nutrients. Coughing is important to clear out secretions from the airway. Some patients with respiratory illness have weak coughs and have difficulty getting the secretions out of the airway. Secretions can obstruct the airway making it difficult for the lungs to get the oxygen they need. Suctioning removes the secretions from the airways which will allow the patient to breathe better.